Mark Freeman, 59 of Cranford, NJ passed away suddenly on Sunday January 27th from injuries sustained in a car accident. Friends are invited to visit 5-9 PM Friday at the Dooley Funeral Home, 218 North Ave. West in Cranford. Mass of Christian Burial will be 9:30 AM Saturday at St. Michael’s Church, 40 Alden St., Cranford. Mark was born on June 16th, 1959, in Long Branch, NJ. He spent his childhood in Lake Hopatcong, NJ, before traveling the country, and eventually ending up in Florida where he met his wife of 29 years Linda Buontempo Freeman. Following in his father’s footsteps, Mark began a career in carpentry. Eventually owning his own business Stairworks in Cranford, NJ. Mark loved life, and truly believed in living it to the fullest. He counted down the days till Summer, and could be sure to always tell you where the best place to eat was. He filled the lives of his family and friends with tons of laughter with his wry sense of humor. Mark is often described by his loved ones as “everyone’s second dad”, loving his children’s friends as if they were his own. 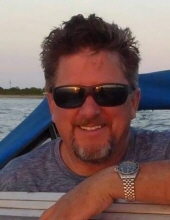 He was happiest on his boat watching the sunset, riding his dirt bike with friends, or spending time with his family in Cape May and Wildwood. His family was everything to him. He will be sorely missed by everyone that ever knew him. He was predeceased by his father John Warren Freeman. Surviving are his loving wife Linda Buontempo Freeman, his children Steven, Kristen, and John, his mother Roselyn Zotollo Damen, and her husband Chris Damen, and a loving support system of Aunts, Uncles and Cousins. He also leaves behind his Stairworks family Anton, Tan, Steven, and Annie. To send flowers or a remembrance gift to the family of Mark Freeman, please visit our Tribute Store. "Email Address" would like to share the life celebration of Mark Freeman. Click on the "link" to go to share a favorite memory or leave a condolence message for the family.